Is Goldberg’s Prentice Hospital terminal? The days may be numbered for the quatrefoil building at 333 E. Superior in Chicago, the old Prentice Women's Hospital, where both my children were born. 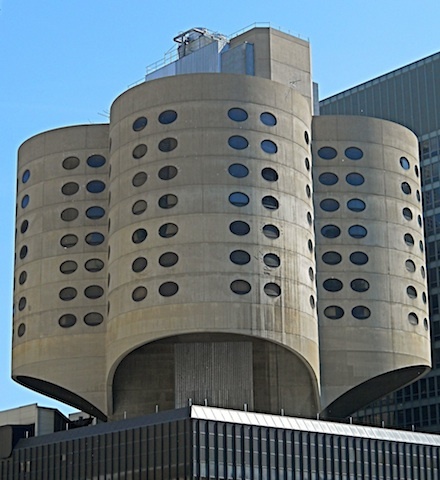 Northwestern Memorial Hospital, which opened a shiny new Prentice in 2007, plans to tear down the old building to put up a new research center. Preservationists are gearing up for a fight to preserve Bertrand Goldberg's 1975 design, which echoed some elements of his hugely successful Marina City downtown residential development, finished in 1964. Hospital buildings don't have long lives; indeed, they are often obsolescent soon after they are built. That was certainly true of NMH's Gothic-style Wesley Hospital, so impressive it was subtitled the "cathedral of healing." Wesley opened on Dec. 6, 1941, literally on the eve of U.S. involvement in World War II, which changed everything, as wars so often do. The new Prentice now stands at 250 E. Superior, on precisely the spot Wesley once occupied on the NMH campus. NMH's first women's hospital shared space at 333 E. Superior with the Stone Institute of Psychiatry, which stayed after labor and delivery et al. moved from the poured-cement structure into the new Prentice. The psychiatry department will move out in September, and the building will then be torn down, according to Northwestern University spokesman Al Cubbage. The university explored and rejected the idea of recycling the existing building for another use, Cubbage says. "At this point, the university’s plans are to take that building down and use that area for additional research facilities that would be constructed in the future,” Cubbage told the Chicago Tribune's Blair Kamin. The "old" Prentice has many detractors who believe the building is ugly. Even when my younger daughter was born there 13 years ago, mothers (and doctors) were complaining the facility was outdated. Prentice was built to last 30 to 40 years; however, the services it offered were so popular it barely made it past 20 years. Planned for 5,000 annual births, it was handling more than 10,000 a year at the end. And, things changed. The obstetric anesthesiology department, which by 2007 was hugely important, was not on the drawing board when the facility was built. I loved the old Prentice — its pie-shaped rooms, the intimacy of its floors, the stunning views of Lake Michigan and the city. Preservationists are understandably upset about the building's impending demise, and are hoping to succeed with an end-run around NMH. Goldberg historically is an important Chicago architect, but his work isn't old enough to have gained the gravitas it deserves, or the protection it needs in terms of landmark status on a local or national basis — and that includes Marina City. The local alderman, Brendan Reilly, has secured a 60-day delay, which might give friends of "old" Prentice a chance to organize. Personally, I would bet on the hospital getting its way on the "old" Prentice. As Mark Twain said, they aren't making any more land these days. Northwestern University/NMH, a major medical school/hospital/research complex, is likely to prevail in doing what it has done for decades on its lakefront campus — raze an old hospital building to create a new facility that reflects the latest knowledge, technology and priorities. I'll be very sad to see the old girl go, if indeed that is how this story ends. Here's a bit of irony: “Bertrand Goldberg: Architecture of Invention," opens September 10 at the Art Institute of Chicago.